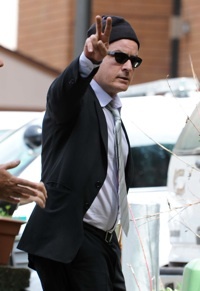 Charlie Sheen pleaded guilty to misdemeanor assault in Aspen today, ending a family drama that began last Christmas. In a slap in the face to all domestic violence victims, Sheen received a sweet deal that basically amounts to less than a slap on the wrist for allegedly holding a knife to Brooke Mueller’s throat and telling her he was going to kill her — all while their twin boys slept in the next room. According to the terms of Charlie’s deal, he gets 30 days of rehab, 30 days of probation and 36 hours of anger management classes in exchange for dropping two charges of felony menacing and criminal mischief. It gets better: The actor is getting credit for “time served” — he already spent 30 days at Promises Malibu after the incident, so all he has to do at this point is check in and leave right away. He also already completed the anger management classes. Really the only punishment for Sheen at this point is the probation — a whopping 30 days — during which he can’t drink or do drugs. Now that the case has cleared the courts, the road is paved for divorce. Sheen and Mueller already prepared divorce docs back in June, but held onto them because they didn’t want to strengthen the case against him. In the agreement, published by TMZ, Brooke gets $55,000 a month in child support, 50% of the profit from the sale of the twins’ baby photos, several bank accounts and a lump sum of about $750,000. Charlie keeps the house but has to buy Brooke out of her $1 million share. In return, Charlie gets joint custody of the twins, all of his Three and a Half Men money, keeps his $5.6 million watch collection and puts a gag order on Brooke so she can’t talk about his drug use or extramarital affairs.